With the newest Mortal Kombat game just around the corner, many people (myself included) are preparing themselves by going back to Mortal Kombat 9 to either re-learn the game, or really get a feel for the play style. Of course, the most iconic part of Mortal Kombat is the fatality: the post victory chance to FINISH your opponent. 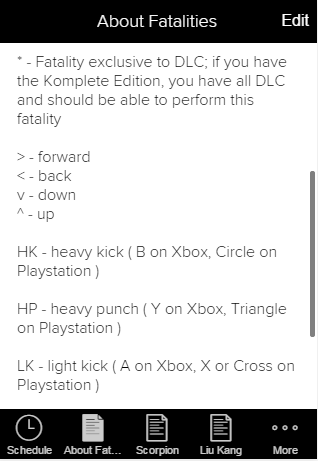 Of course, every fatality has it’s own command patterns which are hard to memorize, and the move list is inaccessible in an online battle, so often I end up getting a comparatively lame victory on the games I do end up winning. I thought, “man, it sure would be nice to have a notepad with all the fatalities open and nearby whenever I need.” Well, I later decided on something better than a notepad: a mobile app. With phones never farther than an arms reach away, and fatalities rather complex to memorize for every situation, this app will simplify fatalities and make them more accessible to everyone. The interface has a brief explanation page that explains the “code” used to convey each button pressed. Each page beyond that is every character playable in the game, arranged in alphabetical order for easiest access. The idea of this app is so you can pick your character and load the app while the match loads or quickly after a victory to cash in your well earned fatality. 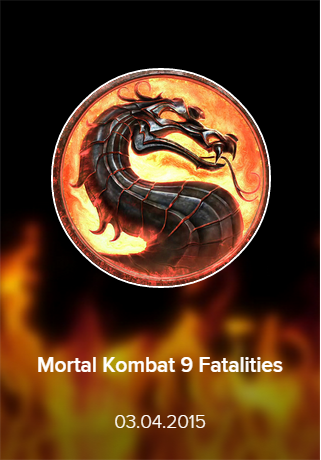 As a bonus, I’ve also added an event calendar for the release of MKX; if I get an overwhelming positive response to the app, I will consider updating the app to accommodate the new game fatalities, and maybe even the brutalities. For now, you can access the app right here. ← Is Super Smash Brothers a Fighting Game?